Drained fertile peatlands around the globe are hotspots for the atmospheric emission of laughing-gas – a powerful greenhouse gas called nitrous oxide, which is partly responsible for global warming and destruction of the ozone layer, a new study shows. The authors of the study – published in Nature Communications – are calling for increased conservation of fens and swamps to help reduce the impact of climate change and protect the ozone layer. Prof Ülo Mander, Senior Lecturer in Biogeochemistry, at the University of Tartu, who conceived this research with a global network of 36 scientists said: "Nitrous oxide is no laughing matter – it is a significant contributor to global climate change and depletion of the ozone layer, which protects our planet from cosmic radiation. The report's lead author Dr. Jaan Pärn is a joint exchange postdoctoral fellow at the University of Birmingham working under with Dr. Ullah and Prof. Mander's supervision. "Our findings show that artificial drainage will be the primary driver of future changes in laughing gas emission from organic soils," he explained. "This effect will be more pronounced in tropical regions leading to more nitrous oxide emitted to the atmosphere. "Therefore, conservation and restoration of tropical fens and swamp forests should be made a priority to avoid and reduce emissions of this grim laughing gas." Dr. Jaan Pärn added that predicting soil response to changes in climate or land use was central to understanding and managing nitrous oxide emission. The survey found that changes in nitrous oxide levels flux emission can be predicted by models incorporating soil nitrate concentration, water content and temperature. Nitrous oxide emissions increase with nitrate and follow a bell-shaped distribution peaking at intermediate soil moisture content around 50%. Both nitrate and soil moisture together explains 72% of laughing gas emission from the global organic soils. For more information, please contact Dr. Jaan Pärn, University of Tartu on +372-55-548-255 or [email protected], or Tony Moran, International Communications Manager, University of Birmingham on +44-0-121-414-8254 or +44-0-782-783-2312 or [email protected] For out-of-hours enquiries, please call +372 55 548 255 (Dr. Jaan Pärn) or +44-0-7789-921-165 (Tony Moran). 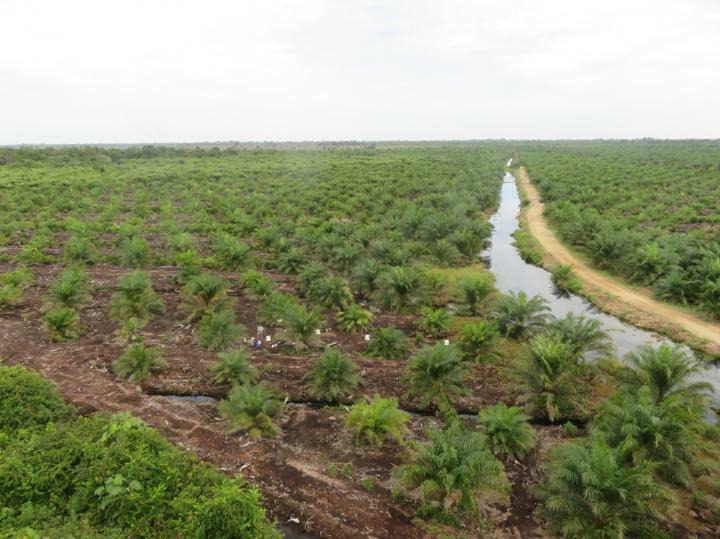 Sampling greenhouse gases in an oil-palm plantation on a drained peat in Klias, State of Sabah, Malaysia. Exceptionally larger emission of nitrous oxide were observed here compared to undisturbed organic soil. Some of the highest laughing-gas emissions in the recently published global campaign were recorded here. Please feel free to use this link in online news articles to enable readers to access the original open access research paper and further the spread of understanding about this subject.